More U.S. consumers expect current mortgage rates to rise further in 2017. According to the most recent National Housing Survey, 60 percent of consumers think the era of rates in the threes are firmly in the past. The survey, which covers 1,000 households, measures changing consumer attitudes toward mortgages and housing nationwide. 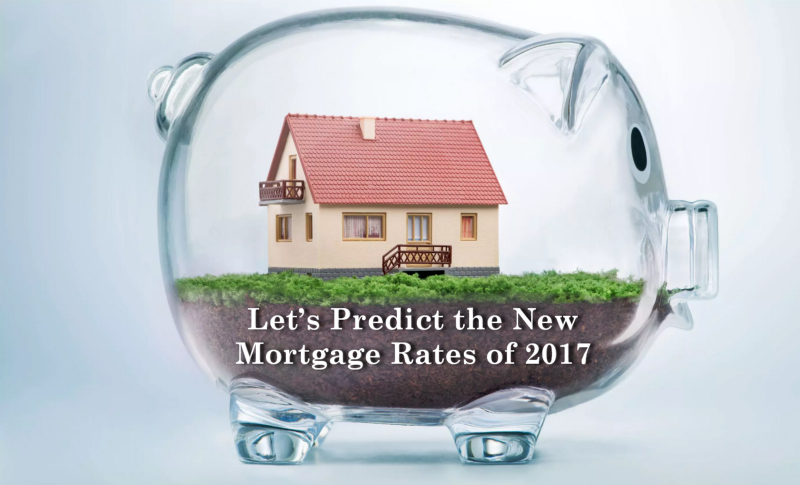 NSH Mortgage in Florida is predicting the new mortgage rates of 2017 will begin to climb and then settle throughout the new year. Attitudes have surprisingly shifted since a few months ago. In October 2016, only half of consumers predicted rising rates in the new year, only 1 person in every 20 predicted falling rates. Then, early in November, mortgage rates had their worst day in three years following an unforeseen outcome to a turbulent election cycle. Thirty-year mortgage rates are still shockingly low. The nationwide average 30-year mortgage rate remains near 4% nationwide, on average, according to mortgage agency Freddie Mac. That was half the historic average of 8.25%. It’s still a favorable time to be shopping for a mortgage. The average consumer is forecasting higher rates this year, but that is not keeping them from buying a home. Rising rental prices, and what it costs to move into a rental unit, are making the relative cost of owning a home lower each day. According to Fannie Mae, 89 percent of consumers calculate that home prices will rise or hold steady this year. But rising home prices are not distinguishing renters’ desire to buy. Consumers expect home prices to rise at least 2% over the next 12 months. A $300,000 home will be worth $6,000 more one year from now, say survey respondents. That is one incentive to buy now. The other incentive has to be associated to the amount consumers expect rent to increase: 3.8% over the next year. Renters can either be on the winning or losing side of rising costs. Sixty-eight percent of consumers say they would buy instead of rent, if they had to move today that may prove to be a wise choice. Home sales remain near their strongest levels in eight years and home supply is scarce. New mortgage rates of 2017 are still maintaining at historic lows, and demand is expected to remain strong. Home buyers are getting into homes for less money per month than they would pay for rent. Low rates are increasing home affordability for first-time home buyers. Maybe you have been considering about purchasing a home too. After all, the market looks great. Mortgage rates are currently low, rents are rising nationwide, and mortgage lenders are approving more loans. Furthermore, there is an abundance of low and no down payment mortgage loans for first-time home buyers and repeat buyers alike. Among the most common low down payment mortgage options are HomeReady™, which has a three percent down payment requirement. The program is perfect for multi-generational households and even prospective homeowners with roommates. Income from a household member who is not on the loan can help the applicant qualify. Mortgage rates for the HomeReady™ are best for borrowers with strong credit. For buyers with lower credit scores, the FHA program is a low-cost and flexible option. But FHA is not only just for buyers with lower credit scores. Nearly 40 percent of all home buyers under the age of 37, within any credit tier, select FHA. The FHA home loan requires just 3.5 percent down, and that down payment can come from a gift, or even an approved down payment assistance program. FHA allows homes with up to four units (e.g. a duplex, triplex, or fourplex) and the program allows a buyer to have its closing costs paid by the seller. Today’s home buyers have several no-money-down options, too. The VA loan is one of these loans, available to military borrowers and to surviving spouses. The advantages of a VA loan are many, including the lack of mortgage insurance, and the fact that VA loans are assumable, which means that future home buyers may be eligible to presume your home’s existing mortgage rate. In a rising mortgage rate world, assumable loans can be a giant sales benefit. Another available zero down payment loan is known as the USDA loan. Mainly available in less densely populated neighborhoods, the USDA loan allows for 100% financing and very low rates of mortgage insurance. USDA mortgages are available as 30-year fixed-rate home loans only. Lastly, by down payment assistance programs, home buyers can receive a cash grant to cover their traditional home down payment. Such programs do not always require repayment, either. Often, you are only required to maintain your residence for a period of up to five years.